You are given the 12-lead ECG shown in Figure 1 and told it is from a previously healthy 30-year-old man who just presented to the emergency department with new-onset palpitations. No prior ECG is available for comparison. The patient is alert and hemodynamically stable with a BP = 150/90 mmHg. What is the rhythm? Is this rhythm likely to respond to adenosine? Figure 1 – 12-lead ECG from a 30-year-old man with palpitations. Is adenosine likely to convert this rhythm? (Figure reproduced from ACLS: Practice Code Scenarios-2014 - Case A). INTERPRETATION: The rhythm is rapid and regular at a rate of ~180/minute. The QRS complex is obviously wide. No P waves are seen. Thus, the rhythm is a regular WCT (Wide-Complex Tachycardia) without clear sign of atrial activity. VT (Ventricular Tachycardia) must be assumed until proven otherwise! As previously emphasized on ECG Blog #23 – VT is by far the most common cause of a regular WCT when there is no sign of atrial activity (accounting for >80% of cases). The bizarre axis deviation during tachycardia in Figure 1 makes diagnosis of VT a virtual certainty. IF there is No Pulse in association with sustained VT – Treat the same as for ventricular fibrillation (= immediate unsynchronized countershock). IF there is a pulse, but the patient is hemodynamically unstable (hypotensive, having chest pain, shortness of breath or mental confusion) – there is no time to lose. As a result – immediate synchronized cardioversion is in order. But IF the patient with sustained VT is hemodynamically stable – then there is at least a moment of time to contemplate options and initiate a trial of antiarrhythmic therapy. Much has been written about ACLS recommendations for the treatment of sustained VT (See this pdf from Section 07.0 on Known VT excerpted from ( our ACLS-2013-ePub). For the patient who is hemodynamically stable – amiodarone is usually the first antiarrhythmic agent tried. Other medical options for treatment of sustained stable VT include procainamide, lidocaine, magnesium, and beta-blockers (depending on clinical circumstances). Not generally appreciated is the potential role of adenosine in the management of known VT – for WCT of uncertain etiology – and especially for the clinical situation posed by this theoretical case scenario for which adenosine may be the agent of choice. Adenosine is an emergency treatment of choice for supraventricular tachyarrhythmias. One or two doses of the drug is successful in converting over 90% of reentrant PSVT. Even when adenosine does not convert a supraventricular tachyarrhythmia – it may assist diagnostically as a form of “chemical valsalva” by transiently slowing the ventricular response. 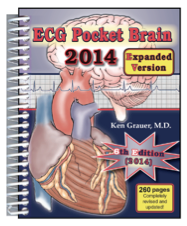 This may facilitate recognition of “telltale” atrial activity – thereby allowing definitive diagnosis of the rhythm. Because of its ultra-short half-life (less than 10 seconds! ) – adverse effects produced by IV adenosine are usually short-lived. As a result – the drug has been used in the management approach to a regular WCT of uncertain etiology. Traditionally, it has been thought that IF the WCT is supraventricular in etiology (SVT with either aberrant conduction or preexisting bundle branch block) – then adenosine is likely to either convert the rhythm or transiently slow the ventricular response enough to allow definitive diagnosis. On the other hand, if the WCT is VT – then adenosine will not be effective (but because of its ultra-short half-life – the drug will almost always be reasonably well tolerated without lasting adverse effect). Adenosine-Responsive VT: Recent appreciation of a number of adenosine-responsive forms of VT mandate modification of previous thinking. Although most often associated with RVOT (Right Ventricular Outflow Track) VT – a number of other adenosine-responsive forms of VT have been identified, including forms that are associated with ischemia and fascicular WCT. The proposed mechanism of action of adenosine in these nonreentrant catecholamine-mediated forms of VT is thought to relate to adenosine receptor inhibition of adenylate cyclase, as well as modulation in autonomic tone. 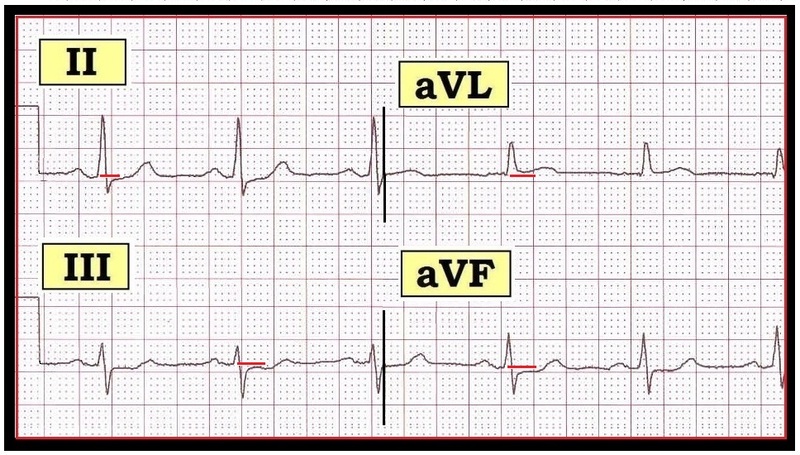 RVOT VT is suggested by the finding of VT with LBBB-type precordial lead morphology in association with an inferior axis (with positive QRS complexes in II,III,aVF indicative of a superior origin for the impulse). 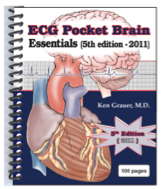 This ECG picture is seen in Figure 1. Clinical characteristics of RVOT VT are typically similar to that in this case (a patient ~20-40 years old; lack of underlying structural heart disease; precipitation of symptoms with exercise, stress, caffeine intake or other catecholamine-mediated activity). BOTTOM LINE: Overall – adenosine-responsive VT makes up a minority of VT cases. That said – determination of the true prevalence of this entity is challenging, and determined in great part by the associated clinical circumstances of the case at hand. This diagnosis should be suspected when a previously healthy young adult presents with a WCT precipitated by exercise, stress, or other catecholamine-mediated activity. This is especially true if the WCT manifests precordial lead LBBB-type morphology in association with an inferior axis (as in Figure 1). However, given the heterogeneous nature of adenosine-responsive VT – other QRS morphologies may certainly be seen. One therefore cannot reliably predict from assessment of the ECG which patients with VT are likely to respond to adenosine. Appreciation of the entity of adenosine-responsive VT provides a rationale for earlier empiric inclusion of adenosine in the treatment approach to both WCT of uncertain etiology as well as for presumed new-onset VT.
Adenosine is likely to convert those WCTs due to reentrant PSVT with either aberrant conduction or preexisting bundle branch block. It may also convert a small (but not insignificant) percentage of cases of VT that are adenosine-responsive. Response of a WCT to treatment with adenosine should no longer be taken as reliable indication that the WCT was supraventricular (since it may have been due to an adenosine-responsive form of VT). These patients with WCT that responds to adenosine should be referred for electrophysiologic evaluation of their rhythm disturbance. Markowitz SM, Litvak BL, Lerman BB, et al: Adenosine-sensitive VT Right Ventricular Abnormalities Delineated by MRI. Circulation 96:1192-1200, 1997. Lerman BB, Belardinelli L, West AG, et al: Adenosine-sensitive Ventricular Tachycardia: Evidence Suggesting Cyclic AMP-mediated Triggered Activity. 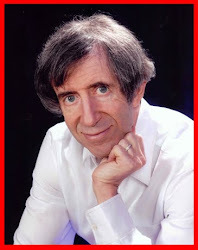 Circulation 74:270-280, 1986. Jane-Wit D et al: Ischemic Etiology for Adenosine-Sensitive Fascicular Tachycardia. J Electrocardiol 44(2):217-221, 2011. Srivathsan K, Lester SJ, Appleton CP: Ventricular Tachycardia in the Absence of Structural Heart Disease. Indian Pacing Electrophysiol J 5:106-121, 2005. The 12-lead ECG shown in Figure 1 was obtained from a 72-year-old woman seen in the ED (emergency department) with new-onset chest discomfort. 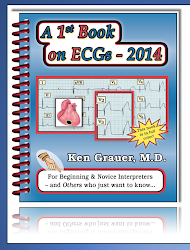 No prior ECGs were available for comparison. The tracing was interpreted as “showing no acute changes”. Do you agree? What else do you see? Figure 1 – 12-lead ECG from a 72-year-old woman with new-onset chest discomfort. Do you agree that there are “no acute changes”? There are Q waves (QS complexes) in anteroseptal leads V1-thru-V3. A small positive deflection (r wave) finally develops by lead V4. Thus, transition is delayed (only occurring between leads V4-to-V5). There is subtle (but real) ST segment elevation in lead aVL. Support that the subtle ST elevation in aVL is a real finding is forthcoming from the ST segment flattening and subtle (but real) ST depression seen in each of the inferior leads (II,III,aVF). CLINICAL IMPRESSION: Given the clinical history of a 72-year-old woman presenting to the ED with new-onset chest discomfort and no prior tracing available for comparison – the findings in Figure 1 are clearly of concern. Lack of any r wave at all until lead V4 suggests prior anteroseptal infarction. The subtle (but real) ST elevation in lead aVL with equally subtle (but real) “reciprocal changes” in leads II, III and aVF suggest that the patient may be in process of evolving an acute high lateral MI (myocardial infarction). 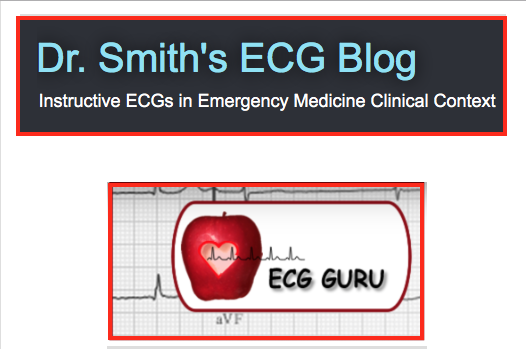 IF this patient is truly in process of evolving an acute STEMI (ST-Elevation MI) – this should be known shortly. 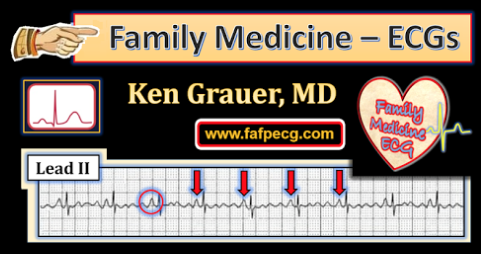 ECG changes of acute MI may evolve quickly – sometimes in less than an hour. We would repeat the 12-lead ECG in short order. Of the 5 lateral leads (I,aVL; V4,V5,V6) – lead aVL views the heart from the highest and most peripheral perspective (looking down at the heart from the left shoulder). 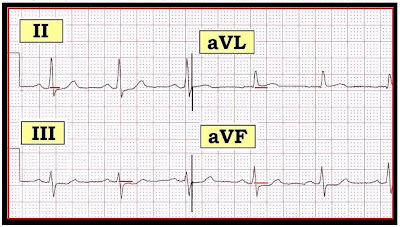 As a result – lead aVL may sometimes be the only lateral lead to show acute changes (as may be the case in Figure 1 … ). ST Elevation – IF the ST is above the PR baseline. ST Depression – IF the ST is below the PR baseline. Figure 2 – Use of the PR segment baseline to assess for ST segment deviations. 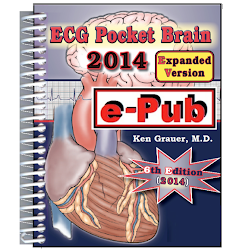 (Figure reproduced from ECG-2014-ePub - pg 46). As noted – the changes in the 12-lead ECG shown in Figure 1 are subtle. The shape of ST elevation is more important than the amount of elevation. Acute MI may occur with only minimal ST elevation. History is ever important. The fact that the patient in this case is of a certain age (72 years old) and that she presents to the ED with new-onset chest discomfort places the onus on us to prove that she is not presenting with ACS (acute coronary syndrome) rather than the other way around. In Figure 3 – we blow-up the key leads of concern. Although the amount of ST segment deviation (above and below the baseline) is not a lot – careful attention to the PR segment baseline (horizontal red lines in Figure 3) reveals that there is ST elevation in lead aVL and reciprocal ST depression in II, III and aVF. Figure 3 – Blow-up of leads II,III,aVL,aVF from Figure 1. BOTTOM LINE: We admittedly are in no way certain that the patient in this case is in process of evolving an acute high-lateral MI. However, in view of the history and the ECG changes described above – we have to assume this is occurring until proven otherwise. 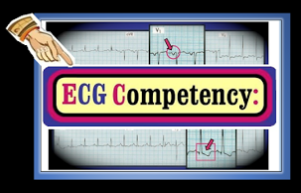 Careful observation – presumptive initial treatment measures – serum troponins – repeating the ECG in short order – and a little bit of time should suffice to clarify the true picture. 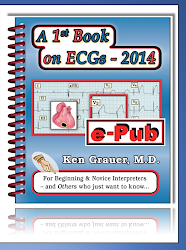 - See ECG Blogs #6 and #7 – and this pdf on ST-T wave changes from Section 09.0 of our ECG-2014-ePub.